Dr. Stya Paul, eminent industrialist, educationist, philanthropist and freedom fighter, provided the foundation and inspiration for the emergence of the Apeejay Stya Group and the Apeejay Education Society as trusted symbols of quality and excellence in the country's industrial and educational landscape. 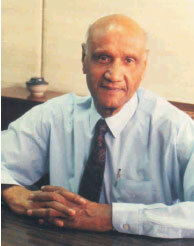 A pioneering entrepreneur with a far-sighted vision of the future, Dr. Stya Paul was instrumental in the rise of the Apeejay Group as one of the biggest industrial houses of independent India, and was a leading architect of the country's emergence as a self-reliant industrial superpower, founded on the strength of Indian capability and enterprise. As Chairman Emeritus, he has guided the Apeejay Stya Group – a privately and closely-held leading Indian industrial and investment House to become one of the major corporate houses of the country, with several alliances, collaborations and significant presence in Europe, Middle East and East Asia. Dr. Stya Paul, fondly called Sethji, was one of the earliest industrialists in the country who recognised the great role that industry could play in providing quality education and to contribute towards nation-building. Towards this objective, he decided to set up not-for-profit educational institutions across the country where scientific and career-building knowledge could be provided along with inculcation of values and an appreciation of Indian culture, arts and heritage. Starting with a small school in Jalandhar in 1967, the 13 schools and 16 institutions of higher learning established by him over the last four decades under the aegis of the Apeejay Education Society have flowered to become symbols of excellence in their various disciplines, moulding the lives and careers of future generations of the country. The year 2010 also saw the realisation of Dr. Stya Paul's lifetime dream of setting up the Apeejay Stya University – a seat of global learning that would bring about transformation of society through value based education, man-making and nation-building, by blending the dual identities of a technology and research based university with a liberal arts institution. Dr. Stya Paul's forays in the field of education exhibited the same meticulous planning, concern for detail and flawless execution that were his hallmark throughout his life. Each of the institutions set up by him was an act of love, and he nurtured them to success by creating a family-like environment through his personal touch, and a shared vision of excellence and ownership with all the stake-holders in the institutions. His vision of value based holistic education, focusing on acquiring thinking skills and 'learning how to learn for life' was truly global, transcending the confines of state and country. It was also Dr. Stya Paul who, as the undisputed voice of the industry in young independent India, first embraced the concept of corporate social responsibility and emphasised the need for an integral relationship between ethics and business. During his long and illustrious career, Dr. Stya Paul has been actively associated with several social, cultural and professional bodies, and held responsible positions reflecting his versatility, leadership and standing in industry and social circles. His philanthropy and generosity knew no bounds, and throughout his life, he helped the physically-handicapped and the needy with financial help and educational/vocational opportunities, thus enabling them to join the mainstream. Over the years, numerous honours and accolades were bestowed upon him in a life richly lived and full of sharing and caring. But he never desired any monuments to himself, though there are living monuments, in the shape of multitudes of people across the country, who share their memories of how he touched and transformed their lives in his own unique way. A true Karmayogi, Dr. Stya Paul retained his zeal for hard work even in his advanced age and remained keenly involved in the management of the Apeejay institutions well into his nineties. Active till the very end, he left this world peacefully on June 7, 2010 while preparing to leave for his office. But his life's work and achievements, and the lasting legacy of excellence that he leaves behind, will continue to inspire and guide us in all our endeavours, as we strive to achieve the goals to which he devoted his life. Like the ever-soaring falcon of Iqbal's couplet that inspired Dr. Stya Paul throughout his life's journey, his spirit will live on forever. It is not a disgrace if dreams are unfulfilled, but it is, if we have no dreams to dream!